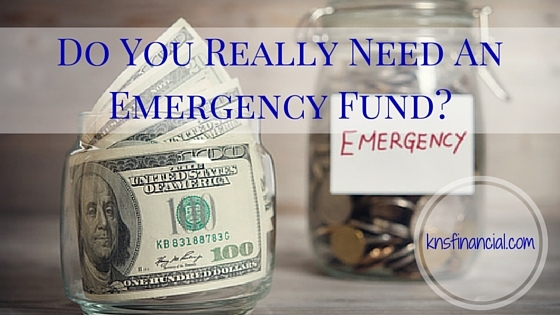 Emergency Fund: Do You Really Need One? You are here: Home / Personal Finance / Do You Really Need An Emergency Fund? Previous Post: « Should You Really Pay for These Things? I have an emergency fund though I never kept in on a Bank rather I keep it in the safest place. I guess it’s more idealistic that you keep your emergency fund with you ’cause you can hurriedly get some whenever there’s an emergency money call. I keep my emergency fund split up. I currently have 4 months expenses in cash, and 3 months expenses in company stock through my ESPP. I also treat my Roth as my back up emergency fund which I would not want to touch unless a HUGE emergency. That has another 7 months work of expenses. I’m young so no where near 59 1/2 so the 401k and Rollover IRA are untouchable. I have an emergency fund which is equivalent to a years worth of my income. I know it is a bit more however I really feel comfortable with that amount of cash in the bank. Apart from the fund I have investments in a lot of short term ETF’s which I are liquid enough to qualify as emergency fund. I totally agree with you on the EF. However it doesn’t have totie up a significant amount of money if you are not comfortable with that. In that case, maybe a 3 months salary worth can be held in your EF as a first line of defense while keeping an empty line of credit as a second line of defense in case things get worse. Yeah, I tend to be very conservative when it comes to being prepared. But, you are right, it doesn’t have to be 1 year for everyone. However, I do think that the decision needs to be based on more than just fear of tying that much money up – it needs to be well thought out and calculated. Thanks for the comment…of course Akismet didn’t like it. I think EVERYONE needs an emergency fund. How much you need is up to you. Some people can adjust their entire lifestyle if something comes up and all they may need is 3 months pay while others want to still live comfortably and may need a 6month -1 year cushion. Very good point about being able to adjust your life and keep a lower emergency fund. Another thing I would suggest is to make those adjustments now in order to build up the EF (they may like it enough to stay in that state). Great post. Many times efunds are difficult to create because they dont earn much interest and just sit there, waiting for someone to find an “emergency” to use the money for. Trips/christmas/etc is not an emergency. The money needs to be liquid or else you wont get to it in time to take care of your emergency. Also, where did you get the code for that yakezie widget? I agree, it can be tempting to just spend the money if it’s sitting there not earning a lot. Although, the financial peace that you receive from being disciplined is unbeatable! Dave Ramsey calls an emergency fund Murphy’s Repellent. I love that, because Murphy’s Law does seem to kick in much more when you aren’t prepared for it. I’ve seen many people use their credit cards as their emergency funds, but I have never seen the strategy work well. Once the emergency was over, the debt tended to stick around for years afterward. I’ve never heard the “Murphy’s Repellent” comment before. That is very accurate! I think many people who rely on credit cards are making a huge mistake! Especially to gain a few extra basis points on your savings. Khaleef, Great review of why it is important to have an emergency fund and under what circumstances should one increase it. I certainly keep an emergency fund. It is part of my plan to be financial comfortable. I consider it a necessity. The writing that I’ve seen against the idea hasn’t been too convincing in my opinion. I can’t wait until the point when I’m debt free with a fully funded EF! I think one needs to save a bit more for the emergency fund. I would budget at least 3-4 months of living expenses… you never know when you might be out of a job or need to be on disability etc. (I know that the economy seems to be picking up, but you never know!). Once one is out of debt, I would suggest about a year. At that point, you can probably mix up the liquidity/risk, so you can earn a little more between emergencies. Our only debt is our home, and we are paying it off as fast as we can. At our current rate, it will be paid off in 7 years, hopefully sooner. I do not have 9-12 months of cash in an emergency fund. I have a lump of money set aside that I do not touch if I can help it, but I do not stress if it goes below a certain level. In a absolute true emergency, if we did exhaust our savings, I could tap our home equity line of credit, which would be an absolutely last option, not for tvs or vacations. I’m glad to hear that you are working toward paying off your home. Many writers will brag about being out of debt, but have a 300k mortgage weighing them down! One can become too caught up in an EF, and began to put too much trust in it. Anything can happen, so it pays to not stress out if you ever have to use it – that’s what it is there for! Back in the day, we had to face emergencies with nothing but credit. We made very little money, and didn’t realize living on credit cards was a bad thing 🙂 now we do have a good sized emergency fund that would certainly cover some of the major problems that are possible out there. We have had to dip into it on occasion and are able to quickly recover, without all the stress or extra expenses that we used to incur. Hey Jesse, I went through the same thing. That is why I recommend a larger emergency fund than many others. I lost my job without an EF – I was plowing every dime into debt repayment – then I was forced to live off of credit! Let’s be glad that those days are behind both of us!